I Don’t Mean To Be Dramatic, But . . . . This is how my Wednesday started. Again. I’m sure you all remember last summer when my car had a come apart on four separate occasions and I and my savings account fell apart right along with it. I got all of that fixed and we have been happily driving together for just over a year now. Here’s the truth of it. I owe $87 on my car. We all know what that means. I’m terrified to make that last payment because the precise moment that payment clears my bank, my transmission is going to fall out of the bottom of my car on I-40. I thought that’s what happened on Tuesday night when I was stranded alone at work, yet I’m proud to say I didn’t cry even once. Have I grown up? Am I callused? Maybe. What I did do was call roadside assistance (the program I’ve paid $2.99 a month for seven years for and only used once) and ask for a jump start. 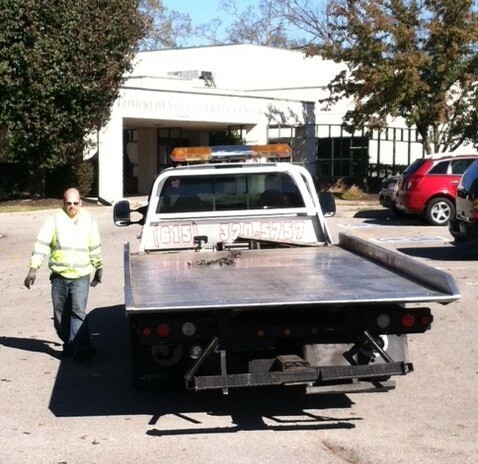 After dissecting everything that happened when I turned the key, roadside assistance opted to have me towed instead. It was late, dark and 27 degrees so rather than wait for an hour on a tow truck, I decided to let it sit overnight and called Pee-tah for a ride. He’s such a gentleman. He rescued me, offered me dinner and dropped me off at my door when I said no. He knew better than to push too hard. This is why we date so well. Wednesday morning I cornered the maintenance guy I like so much, Daniel, and asked for his help. I just wanted someone with more knowledge than how to crank a car to tell me what I should expect to hear from the repair shop when they give me the skinny and the cost. Remember last year I paid far, far too much to get my brakes done (screw you, Firestone) because I am dumber than a box of hammers when it comes to cars. To prove to Daniel that I do know something about a car, I ran down to the parking lot to open my hood in preparation for his ministrations and in doing so, saw something utterly disgusting. Murphy (screw you, Murphy) had either barfed or had some sort of intestinal disturbance on the hood of my car, right between the hood and windshield, actually. I hate that cat sometimes. Why does he do this to me? Why?! I grabbed a wad of napkins from my car – I keep them to blot the shine from my nose and never thought I’d have to use them to clean unspeakable Murphy innards from my car – and cleaned it off, hoping that Daniel would never notice I’d been driving around with poop on my car. Oh, hurk. Oh, my stomach. I threw it over into the grass, very far from my car, and threw the wad of napkins away. Lunch was not going to happen that day, I could already tell. Blergh. This gets worse. I want you to guess who stepped in it. Just guess. Poor Daniel who is so sweet and so sincere in checking my battery and banging around under my hood, that guy who is just the nicest man, doesn’t really stand still all that well. I forgot about that when I threw Murphy’s guts. I remembered it, though, once Daniel started pacing and then I got nervous. I threw the innards very far away from every car, very far away from where everyone walks. I made sure of that. But Daniel in his pacing walked right in it and I was horrified. “Oh my God, what was that? !” he questioned as he looked at the bottom of his shoe. “Oh, gross! Is that mud? That’s mud, right?” He began shuffling on the grass, making his way over to the sidewalk to scrape his shoe. “Is that crap? Did I walk in dog crap?” The look on his face was so disgusted. I just stood there, and I could feel the laughter start bubbling from the very bottom of me. I know it isn’t funny! I know that! I’M SUCH A TERRIBLE PERSON! Daniel, one of the nicest men I know, felt really bad for me and said over and over, “Jimmie, I’m so sorry about your car. I wish I could fix it for you.” And all I could do was nod and squeak out a thank you and try my damnedest to not let the laughter that was literally taking over my whole body not explode out of my mouth. Why am I so bad? I deserve to have my transmission fall out of the bottom of my car. 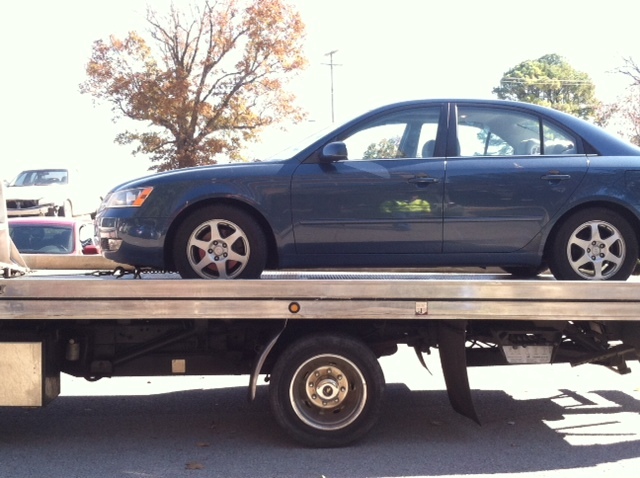 Turns out, however, it was just a bad battery. The kind people at Firestone offered to install one for merely $144 plus tax and labor (screw you, Firestone) so I drove on down to Advanced Auto Parts and got one for $116, tax and labor included. Got to get my savings back up for when the shocks rust and disintegrate into nothing, you know. Once that last payment is made it will happen. Perhaps I’ll buy Daniel a new pair of shoes, too. I’ll take it out of Murphy’s cat food allowance. Previous Jimmie, As Per Usual Next Snow Day! It hurts! I’m dying here! Does he read this? What a confession! Bwahahahahaha!! No, he doesn’t. Here’s hoping no one tells on me. NO ONE TELL ON ME! Oh I am so telling on you!! That is hilarious! If you tell on me, I will no longer bake you muffins. tooooo funny!!!!!!!! love it, secret is safe with me. However I will have to duck tape my best friends mouth when she reads it… if by chance she doesn’t die from laughter first…. this was amazing!!!!!!!! I can’t focus for the rest of the day…can’t look @ him the same!! !